Can you earn respect if everyone laughs at you? In the business world, yes – you can. Many times a large corporation will hold an annual all-employee meeting. It will rent a large auditorium or multiple venues featuring live video feed of speeches from the company CEO and other senior staff. Some employees look forward to such an event, eagerly seeking big-picture vision, renewed motivation, and to get some sense that the work they do helps to achieve a greater good. Other employees show up for the treats and freebie giveaways, or simply because they have to. But regardless of the motivation for employees to show up, any and all can find themselves engaged in the meeting, the speech, the round table – or whatever communication and events you plan. How? Laughter engages. It's tough to do. When non-funny people try to tell jokes to lighten the mood, it often falls flat. One way to engage a large venue of people is to hire a professional comedian to "warm up" the audience. Once you get people laughing, they are often more receptive to more serious messages. They may also leave the meeting with positive feelings and the incentive to work harder. According to Dale Carnegie's book, Make Yourself Unforgettable: How to Become the Person Everyone Remembers and No One Can Resist, the very act of flexing your muscles into the shape of a smile actually stimulates the production of neurochemicals in the brain that are associated with feelings of pleasure and well-being. 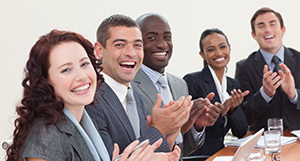 There is also research that indicates that "employees who laugh together stay together." An article published in the March 1994 edition of HR Magazine ("Humor Experts Jazz up the Workplace") observed that in an environment that encourages laughter, employees are more creative, productive, and tend to work better as a team. Another way to engage your audience is for members of the company's executive team to exhibit their own self-deprecating sense of humor. Coach them to take mistakes and word gaffes made during the meeting in stride and laugh at them. When a CEO laughs at himself, it gives the audience the opportunity to laugh along with him. The more warmth and human-ness he shows, the more his employees will relate to him. You can even stage a surprise (with just a hint of a warning ahead of time) that is sure to get a genuinely amused reaction from a senior executive. For example, have his long-time – but now retired – secretary show up on stage to deliver him coffee while he's speaking. Flash a photo on the big screen of his reaction to his 50th birthday surprise party (photo courtesy of his wife), or the time he dressed up for a Halloween event in the office. The point isn't to embarrass your fearless leader – it's to engage your audience with warmth and humor. At the same time, this can convey some very important traits about him, such as his reaction under pressure or when things go awry, his ability to stay focused despite a temporary distraction, and his ability to generate quick-witted responses to unexpected stimuli. Can getting laughed at by the people who work for you actually garner respect? Absolutely. The key is not to control every variable, or to present robotic-like perfection and platitudes. Help the executives participating understand that the objective of the meeting is to engage and communicate. To exude warmth and openness. To inspire and make people feel good about where they work. In short, it's about employee motivation and talent management. So if a glass of water falls over, someone trips on a floor wire, or makes an embarrassing Freudian slip, coach them that laughter will get them through – and quite possibly make it their employees' favorite memory of the event. Bear in mind that laughter can be infused in all types of work situations to help motivate employees – including smaller staff meetings and even one-on-one interactions. If laughter is the best medicine, then engaging your employees in this way may help alleviate whatever ailments prevent your company from achieving its bottom-line goals.